"Full of (piss|pith) and vinegar"
Are both correct/acceptable? Is one preferred? There are no appearances of "pith and vinegar" in COCA. 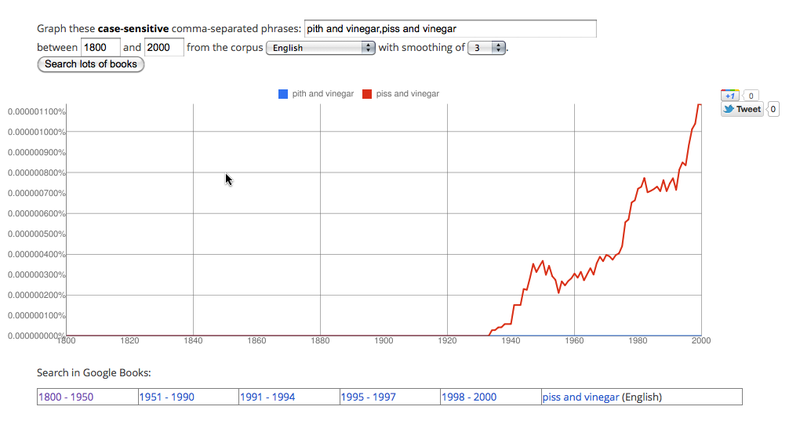 Plotting an Ngram of "piss and vinegar" against "pith and vinegar" shows a similar result; "pith and vinegar" just isn't there. It doesn't mean that "pith and vinegar" is incorrect; it just means that writers prefer to capture the full flavor of the idiom. The OED lists the piss version only. Also, it's far more common on the web. I've never heard the pith version. Not the answer you're looking for? Browse other questions tagged idioms expressions slang or ask your own question. What is meant by “don't piss on my boots and tell me it's raining”? Is “piss poor” apt in this case? What is the meaning of the saying full of beans and vinegar? Is the phrase “full bloodied punch” a common expression?